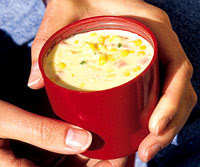 Featuring popular Southwestern ingredients, this spectacular and rich chowder recipe includes corn, jalapeno peppers, and red sweet peppers. In a blender container or food processor bowl combine half of the corn and the chicken broth. Cover and blend or process until nearly smooth. In a large saucepan combine the broth mixture and the remaining corn. If using fresh corn, bring to boiling; reduce heat. Simmer, covered, for 2 to 3 minutes or until corn is crisp-tender. Stir in cooked pasta, milk, roasted peppers, and jalapeno peppers; heat through. If desired, top each serving with feta cheese. Makes 4 servings. Calories 247, Total Fat 3 g, Saturated Fat 1 g, Cholesterol 5 mg, Sodium 363 mg, Carbohydrate 47 g, Fiber 1 g, Protein 11 g. Daily Values: Vitamin A 10%, Vitamin C 61%, Calcium 7%, Iron 13%. This entry was posted on 11:23 PM and is filed under Soup . You can follow any responses to this entry through the RSS 2.0 feed. You can leave a response, or trackback from your own site.